Keeping Your Warm Drinks Warm - A Thermal Properties Approach - Thermtest Inc. In our thermal conductivity perspective series, we present various contexts in which thermal conductivity plays a role, during our daily tasks. The number of times the average person reflects on the effect of thermal conductivity in their daily decision making, is next to none. Believe it or not, thermal conductivity is more relevant to your daily routine than you may think, especially when it comes to your coffee mug. Some people prefer a ceramic mug, over a glass mug, while other people prefer steel. What is the reasoning? Most likely, these mug selections are based on aesthetic preference, and are not scientifically based. Figure 1. 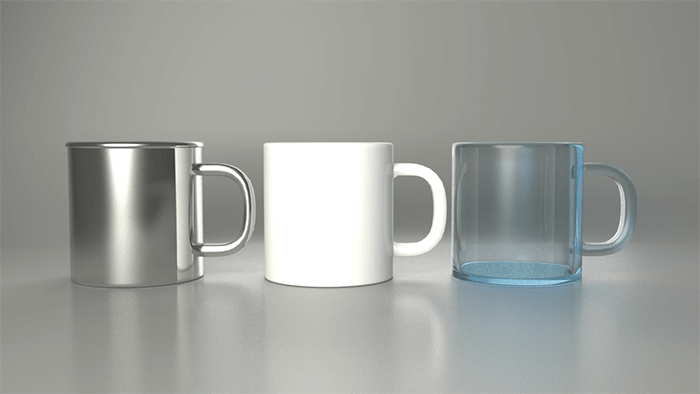 Which of the three mugs will keep your coffee the warmest: stainless steel, ceramic or glass? Heat transfer, specifically thermal conduction, is an important ideology among mug manufacturers, as they strive to produce a quality material that is appealing to customers. There are three different methods of heat transfer: thermal conduction, radiation and convection. The process of thermal conduction is the ability of heat to move from a medium with a higher temperature (liquid), to a medium with a lower temperature (mug), until a temperature equilibrium between the two materials is attained. So, which of the three proposed mug materials will slow down this equilibrium process the most, and maintain a warmer liquid longer? Figure 2. 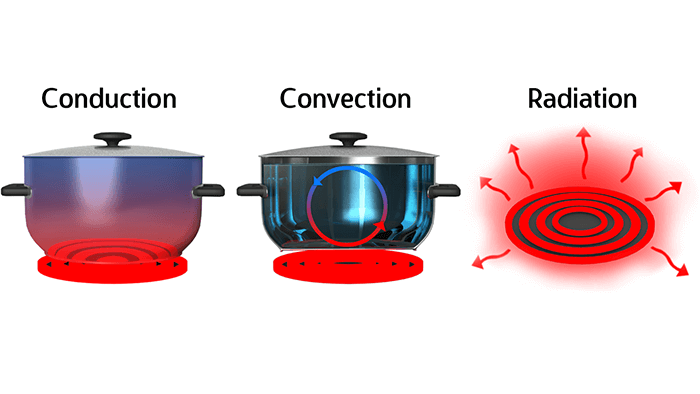 The three methods of heat transfer: conduction, convection and radiation. The steel mug has the highest thermal conductivity of the three materials proposed, 14.3 W/mK. This high thermal conductivity relates to a relatively fast temperature equilibrium between the mug and the liquid, meaning the liquid will cool off rather quickly. The thermal conductivity of a ceramic mug is approximately 3.8 W/mK, while the thermal conductivity of the glass mug is approximately 1.1 W/mK. Due to the relatively low thermal conductivity of the glass mug, the liquid should maintain a warmer temperature, for the longest amount of time. Based on the thermal conductivity knowledge mentioned above, a glass mug should be used to keep liquids the warmest for the longest period, followed by the ceramic, and then the steel mug. The low thermal conductivity of the glass mug, prevents the heat of the liquid from rapidly penetrating and dispersing into the mug. Due to the high thermal conductivity of the steel, the heat from the liquid is rapidly transferred to the mug, and then to the palms of your hands. Although, based on the knowledge surrounding heat capacity, the ceramic mug wins the warm drink award. Heat capacity is the ability of a material to hold heat, per unit volume. Due to the lower density of ceramics, thanks to small pores in the material, heat can be stored within the mug itself, rather than being released into the area surrounding the mug, i.e. the palm of your hands. While the heat stays within the mug barrier, the equilibrium reaction is being maintained between the mug and the liquid, preventing the liquid from cooling off too quickly. The next time you are out shopping for your new favorite mug, remember how thermal conductivity and heat capacity can affect the warmth of your drink, and choose wisely! Assael, M. J., Gialou, K., Kakosimos, K., and Metaxa, I. 2004. Thermal Conductivity of Reference Solid Materials. International Journal of Thermophysics, 25 (2): 397 – 408. PreviousAnnouncement: Thermtest Europe is Now Live! Announcement: Our thermal science education kits are enroute!